Deborah and Maggie met while recording solos for the CD "Harpers Hall Collection, Vol. One". Four months later, after an afternoon of completely butchering some Praetorius, they decided they were a perfect musical match. Equally adept at both dance music and laments, they fearlessly tackle everything from slip jigs to Wagner. 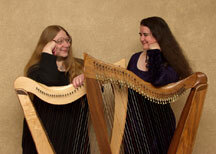 Deborah and Maggie both perform on 36 string lever harps manufactured by Dusty Strings in Seattle, Washington. Deborah has been immersed in traditional music since childhood. A multi-instrumentalist and singer, she has played informally in various folk and early music groups, as well as performing and recording with the Sufi Choir. While in Ireland working on a graduate degree in Old Irish, she found herself living down the street from the Royal Irish Academy of Music and took to nipping across to take harp lessons. She studied for three years at the Academy with Orla Kelly before returning to the United States. Deborah's specialties are traditional dance music and obscure Gaelic songs that defy accompaniment. She has taken a solemn vow never to play "Danny Boy". Maggie came to the harp from a Classical background. Originally a vocalist, she has sung in choirs all her life, including select chamber groups and touring choirs, and has studied solo voice since 1993. After brief, disappointing flings with other instruments, she encountered the harp and was completely smitten. The marriage of harp and voice followed quite naturally. Maggie's specialties are slow expressive airs, melodic counterpoint and pork medallions in a red wine sauce.